After the hazy, crazy, noisy intensity of India, Formula 1 was able to breathe a little easier in Abu Dhabi. 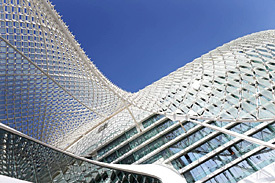 The oasis of the Yas Marina circuit – with its pristine roads, finely trimmed grass, clear blue skies and a chilled marina - proved a welcome refuge for those who had spent a fortnight of wildness in Delhi. And while the Abu Dhabi Grand Prix may not in the past have produced some of the greatest races Formula 1 has seen in recent years, as an event it has proved to be pretty popular. The venue looks fantastic, and this year it had never looked better – with the renamed Viceroy Hotel always an impressive sight as it spans across the final section of track. In entertainment terms, there was plenty to get excited about too. The end-of-day concerts for race fans proved a big attraction – and there were a fair few paddock regulars seen leaving the track early on Friday evening so they could be sure not to miss Kylie Minogue in action. There was a big buzz in the paddock too as Olympic champion Jessica Ennis popped in for a look at F1. While the evening timetable – and a lengthy stewards hearing on Saturday night - forced the media and leading teams to sit it out in the paddock until the early hours most nights, the partying went on elsewhere. And the place to be most evenings was the Amber Lounge, which did not disappoint as it entertained the great and the good from the paddock and beyond. Kylie and Danni Minogue popped in early in the weekend, and where else was Kimi Raikkonen going to be after one of the most thrilling races of the season? After all, having been asked how long the celebrations were going to be, he said: "I have almost two weeks. As long as I manage to get myself to the next race I think the team is happy. I try to get home at some point." 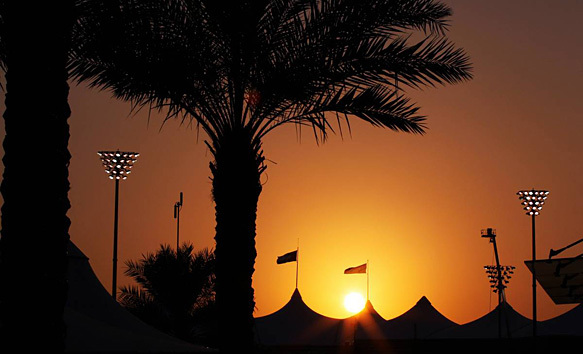 With Formula 1's longest ever season taking its toll on the paddock – everywhere you turned over the Abu Dhabi weekend you would find more people with colds, man-flu or bad coughs – drivers have been doing their bit to stay sharp for the final end-of-season push. Jenson Button acclimatised himself to the heat of the Abu Dhabi Grand Prix with a 35-kilometre run around the Dubai Autodrome, while Bruno Senna spent some time playing beach soccer with the Brazilian national team. But one man who elected to skip the sunshine and do something for other people instead was Lewis Hamilton, who travelled with UNICEF to the state of Madhya Pradesh in India before Abu Dhabi to get a closer look at the hunger and malnutrition crisis affecting nearly half the children under five living in India. Reflecting on his experience a few days later, Hamilton was wide eyed as he spoke about the comparison between the multi-million pound sport of Formula 1 and what he had witnessed. "They are a million miles apart – they are literally at opposite ends," he said. "This is one of the wealthiest places I ever get to go to, and I have been to the poorest places I have ever seen. It was just… it was very, very sad to see. "I was there, and I got to see an issue that not many people are conscious of. Everyone gets on with their day-to-day lives, including me, and there are ladies who are having babies on streets, malnourished kids who are allowed to die. "No one comes to their rescue and these babies don't even have a fighting chance and that is insane - considering there is so much money in the world, there is enough to go around…"
Hamilton knows the chances of his visit making a huge difference are slim, but he hopes at least it will at least make a small impact – which could have greater benefits further down the road. "My visit will be minuscule, it will make the smallest of differences if at all, but it all starts with one step," he said. "Growing up I've always wanted to be someone… like when you put a pebble in a pond and you see some ripples. "I want to be one of those pebbles, to start that splash and then hopefully others will follow. There are lots of people doing great things in the world and there is no skin off my nose to go and spend a couple of days going there. It was really incredible." Formula 1 may exist very much in the now, but there are also efforts to ensure that future generations take good care of the sport. Nowhere is that shown more than in the 'F1 in Schools' initiative, which this year held its world finals at Ferrari World in Abu Dhabi. Featuring the best 33 teams from 22 countries, which had each designed a model car powered by compressed air over a 20-metre race track, this year's winning entrants 'Cold Fusion' came from Australia. After being presented with the winning trophy by Bernie Ecclestone, who has long backed the concept, even legendary F1 designer Adrian Newey was intrigued by the ducting system the winners had used – which was similar to that featured on the RB8. "It is a very impressive car," said Newey. "Obviously the car is just an object, but it is the research they've put into it and the way they've approached it. They have obviously gone to quite some trouble in CFD to try and come up with the lowest drag solution and that's involved a duct system." The looming end of the Formula 1 season often means the time to say goodbye to people who have decided to call time on their career. Sometimes drivers are pushed before they are ready to jump, but others are lucky enough to go in their own time – and arrange a decent sending off. 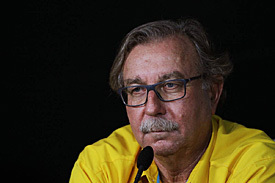 In Abu Dhabi, it was long-serving Renault managing director Jean-Francois Caubet's turn to say his goodbyes as he heads off into retirement after many decades of service for the French car manufacturer. Caubet has had many roles at Renault – both within the road car and racing division - and was lucky enough to be working in F1 during its most recent successful spells both with Williams in the 1990s and Red Bull more recently. Having seen Renault take its landmark 150th victory in India, Caubet was joined by a host of F1's big names, including Renault's current drivers and some rival team principals – among them Stefano Domenicali, Martin Whitmarsh and Mercedes chief Norbert Haug – at a special reception in the paddock on Friday night. In true French fashion, the champagne flowed as F1 waved goodbye to one of its stalwarts – and all on a weekend that brought victory number 151 for his bosses. Does McLaren need a shift in focus?